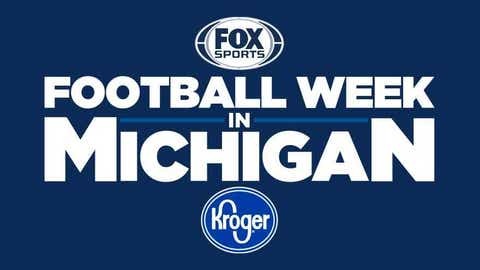 SOUTHFIELD, Mich. — FOX Sports Detroit today announced its comprehensive programming and production details for the landmark Football Week in Michigan initiative, which is presented by Kroger. Exclusive coverage will kick off today and feature more than 55 hours of original football programming, including 19 games airing across FOX Sports Networks. FOX Sports Detroit also announced it will deploy special in-game enhancements for its MHSAA championship games, including Skycam, sponsored by Baker College. Skycam is the only stabilized camera system in the world that can unobtrusively fly anywhere in the defined three-dimensional space. The network’s on-air roster covering the MHSAA games will feature Matt Shepard and Dan Dickerson handling the play-by-play duties, while Rob Rubick, John Wangler and Lions quarterback Jake Rudock will serve as analysts. Brooke Fletcher and Tori Petry will be sideline reporters. In addition, FOX Sports Detroit will also offer viewers an interactive social-media experience to participate in Football Week in Michigan. The football community is encouraged to join the FWIM celebration by using #FWIM2018, and text and photo content will be incorporated into the MHSAA Championship broadcasts. The Football Week in Michigan preview show, airing on Tuesday at 7:30 p.m., will feature play-by-play announcer Gus Johnson and analyst Joel Klatt previewing the Michigan-Ohio State game. In addition to game coverage throughout Football Week in Michigan, FOX Sports Detroit will air “Made in Michigan: Coaching Legends” tonight after our Red Wings coverage. The special 30-minute show has Matt Shepard sitting down with local high school coaching icons John Herrington, Al Fracassa, Tom Mach and Greg Carter to discuss the game and their illustrious careers. New this year is the Legacy Senior All-Star Game & College Showcase, which will bring together the best senior players throughout the state on Nov. 25 for the final game of their high school careers. Mike Martin, who will coach Team Legacy in the game, played for the Wolverines. Greg Jones, the Team Legends coach, played for the Spartans. The game, hosted at the Legacy Center in Brighton and aired on FOX Sports Detroit at 12:30 p.m., will have cameras on the field and microphones on both head coaches. Football Week in Michigan games will be televised on FOX, FOX Sports Detroit, FOX Sports Detroit Plus and the FOX Sports App. CLICK HERE for the complete Football Week in Michigan schedule of games. FOX Sports Detroit delivers more than 350 live local events each calendar year to more than 3.2 million households throughout Michigan and portions of Northwest Ohio and Northern Indiana. For more information, visit www.FOXSportsDetroit.com. Incorporated in Michigan in 1909 and headquartered in Novi, The Kroger Co. of Michigan operates 122 Kroger stores, 75 fuel centers, 104 pharmacies and the Michigan Dairy. Michigan Kroger’s 19,000 associates are dedicated to the Kroger Purpose: to Feed the Human Spirit by serving the region through food, inspiration and uplift, and creating #ZeroHungerZeroWaste communities by 2025.